The vital promotion goal we missed. We had moved from Cambridge to Toddington, near the M1 and famous for its service station. For some reason my wife agreed to go to an away match: United’s biggest game in the four years they had been in the Football League. We had two games left and needed to get at least a win and a draw from them to guarantee promotion to the dizzy heights of Division Three for the first time. The problem was that the two games were against our promotion rivals: Aldershot away on Tuesday, 24 April 1973 and Mansfield at home four days later. I met Sue from work in Dunstable and down the M1 in our 1965 Mini we went. At the Recreation Ground there were huge queues waiting to get in, with three or four thousand supporting United. We missed the first 10 minutes, and had to stand quietly, surrounded by Aldershot fans. The attendance of 10,680 was more than double the normal gate. 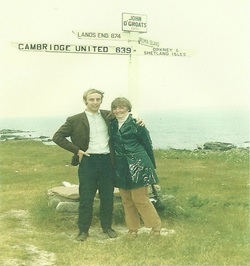 Above, Roger and Sue Flack on their travels again, this time 639 miles from the Abbey. Right, Brian Greenhalgh, who scored the goal they missed at Aldershot. discussing the next big promotion game in four days’ time, but we had lost – dream over. But we were amazed to hear the United fans reliving the goal Brian Greenhalgh had scored in the fifth minute, before we'd got in the ground. How could we have missed it? It was a 1-1 draw and the promotion dream was still on. On the Saturday we beat Mansfield 3-2 and won promotion in front of a gate of 11,542. It was the same team for both games: Vasper, Thompson, Akers, Eades, Guild, Rathbone, Walton, Watson, Ross, Greenhalgh, Lill. Sadly, United couldn’t get the hang of Third Division football and were relegated after one season. And we moved back to Cambridge after staying in Toddington for just two years.